Today I had to take the car in for some warranty work. I took the bike on the bike carrier, dropped off the car and set out riding. I rode from the dealer on the west side of Fort Worth to the Stockyards on the north side and got me some lunch at Joe T. Garcia's, one of the more well-regarded Mexican places in town. The ride out was all on surface streets (since I didn't really have a plan when I started). Along the way, I crossed over the Trinity River (and bike trail) in River Oaks and made a mental note of it for my return ride. After lunch I rode right to the trail where it dumps into the Stockyards, and followed the river downtown, then back to the northwest, taking a branch that I'd never ridden and eventually came up where I had noted the crossing earlier. From there I retraced my steps, more or less, back to the dealership. The Trinity River Trail has several branches that all come together downtown. They all follow branches of the river which winds through Fort Worth. In my experience, the southwest branch has the most traffic. The branch that heads north to the Stockyards and the other branch that heads northwest to River Oaks were both deserted; I could probably count the number of people I saw on my fingers over about 10 miles that I was on the trail. I was wary because I've heard of people being jumped on MUPs, but all the people I saw were quite harmless. The worst disruption was a young mother out for a walk with her two daughters on their bicycles, plus their two dogs who she let run loose. I was a little apprehensive, but the dogs pretty much ignored me as a rode through. Here is a link to a bikely map of my route. 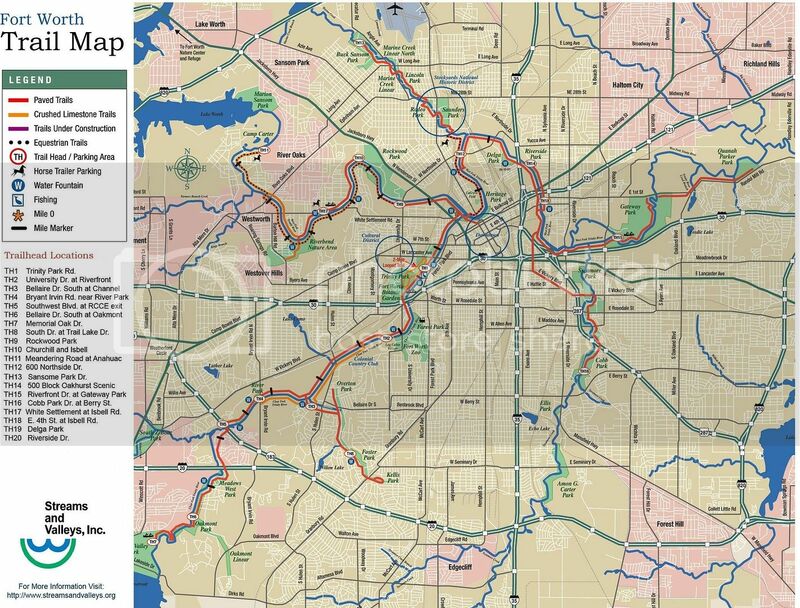 And here is a link to the Trinity River Trail map. Thirty-three+ miles on the Dumpster Queen. It's proving to be a very easy bike to ride.